If you want to unlock bootloader on Oneplus 6t. Then you are the right place. This is the complete guide on How to unlock bootloader on Oneplus 6T. I’ve outlined the entire process in plain English below. When it’s come to root Oneplus 6t, Install TWRP or installing any custom ROM. First thing you need to do is unlock bootloader of Oneplus 6t. Oneplus 6t is the new successor of Oneplus 5T. This new phone comes with new design and packed with lots of new feature. Oneplus 6t comes with edge to edge display and the indisplay fingerprint scanner, Which is one of the most trending feature of this year. Many oneplus fans are waiting for use this phone while if you have got your hands on this phone and you wanna to get root access on the phone and install custom Recovery.Then, First of all you need to unlock Bootloader of Oneplus 6t. So here in the guide, we will let you know how to unlock bootloader on OnePlus 6t smartphone in an easy way. Don’t Miss : How to Enable 4K 60fps Video Recording On Samsung galaxy note 8 & Samsung galaxy S8. If you are new to android operating system and you don’t know what bootloader actually means then let me clear this to you. A bootloader is a code which runs when we turn on our device. It helps to load the kernel sources, ramdisk and other processes on the phones. Same rule is applied on computer and laptop which we use in our home and office. If you want to make any change in your system then you have to first unlock the bootloader of your device. Without rooting you can’t root your device, can’t install TWRP, Can’t install any custom ROM. Manufacturer lock the bootloader of their phone because of some security reasons. Because a locked Bootloader phone is more secure than an unlocked bootloader Phone. One more reason can be that they don’t want their users to install any custom ROM on their phone and want you to stick with the Stock ROM. But once you unlocked the bootloader of oneplus 6t, It will give you whole access to your phone and now you can customize your oneplus 6t beyond the limit. Display: The Oneplus 6T comes with 6.41″ (16.28 cm) display with a screen resolution of 1080 x 2340 pixels. Rear camera: The Oneplus 6t comes with 16 MP + 20 MP Dual Primary Cameras. Front camera: On front side Oneplus 6T gets an 24 MP sensor. Software: OnePlus 6T run a version of OxygenOS based on Android 9.0 Pie out of the box. How to unlock bootloader on Oneplus 6T : Unlocking bootloader will void the warranty of your Android phone. But you can reclaim the warranty by re=locking the bootloader of Oneplus 6t. Locking and unlocking bootloader on Oneplus 6t is very easy task. You can easily unlock bootloader of Oneplus 6t with some fastboot commands. Read all the steps and follow them carefully. Must follow the prerequisite given below to unlock the bootloader. This tutorial is only for OnePlus 6T users. A working USB cable to connect your phone to Pc. Install latest OnePlus USB drivers on your computer or laptop. Download and install the ADB Fastboot Drivers and you will see the ADB folder on your ADB drive (C:/ADB). How to Unlock Bootloader on OnePlus 6T? First of all take full backup of your smartphone. Like if you have some important photos, Music, videos or document on your phone then please take backup of those file first. Because unlocking bootloader will wipe all your phone data. You can read this guide on How to take Full Backup of Your phone. Now you have to enable developer Option menu on your phone to access a setting that lets you unlock your bootloader. Now as you have enabled Developer option on Oneplus 6t. Now you need to go back to setting and there you will find a new option of ‘Developer option’. Just go to developer option and enable OEM unlocking. How To Enable OEM unlocking on Your Phone? Go to your settings ⇒ Additional settings ⇒ Developer options ⇒ tick the“ OEM Unlock ” checkbox. To make it easier to boot your phone into fastboot mode. We will recommend you to Enable your OnePlus 6’s Advanced Reboot menu. For enabling advance reboot menu first of all you need to enable developer option on your phone. How To Enable Advance Reboot Menu. Now Press and hold Power button and tap on "Reboot." After that, choose "Bootloader" and confirm your choice. Once your phone is booted into bootloader mode or Fastboot mode, Connect your phone to Pc through Usb cable. Now it's time to install install ADB and Fastboot on on your computer. I would recommend you guys to install the latest Version of ADB and fastboot tools, Because some of the older version don't support some of new commands. If you have not downloaded the ADB and fastboot tool, Then you can download it from here - ADB Fastboot Drivers . Now here the bootloader unlocking process get started. 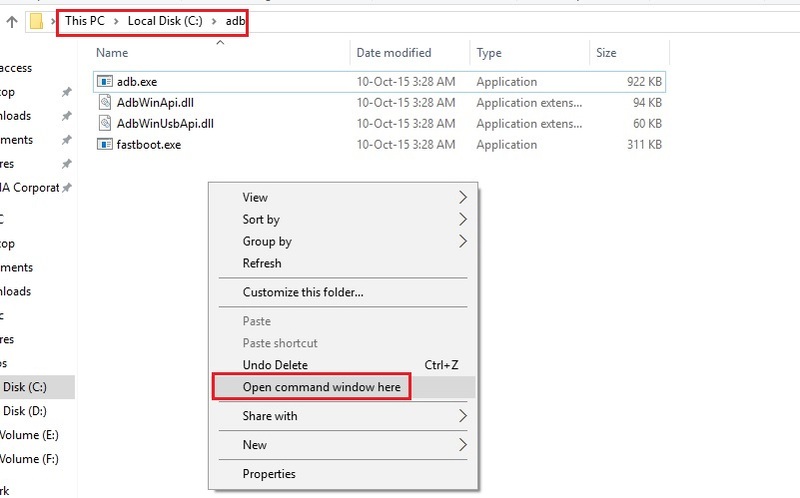 All you have to do is open ADB folder on your windows and press and hold ‘shift’ key and right-clicked anywhere in the folder and select "Open command window here." Next you have to verify that everything is properly connected or not. Just type the following command into the command prompt. If your device is connected properly you will find your device name below the command. If it is not showing the word word "Fastboot," then check check your ADB and Fastboot installation and make sure your USB cable is working perfect. Once your phone is recognised by the above command, Then it's time to actually unlock the bootloader on oneplus 6t. To start this process, Just type the given command below and hit enter on the keyboard. Step 10 ~ Confirm the warning On your phone. Now you will see Unlock Bootloader Warning page on your phone screen, Just press the volume up button to select yes and Press power button to execute the selection. Now this will unlock the bootloader of your oneplus 6t. Now your phone will be automatically reboot and bootloader will be unlocked. As you have unlocked the bootloader of your device so now you can root and install TWRP or any custom rom or recovery on your oneplus 6T. Don't Miss : How To Install TWRP Recovery On OnePlus 6T? Guys, This was the complete guide on How to Unlock Bootloader on OnePlus 6T.I hope you will find this article helpful. If you have still any question regarding this post, then please comment down Below. Share this post if you find it helpful because Sharing is caring.